It’s not often that a book on punctuation can be entertaining. Actually, I don’t think I’ve ever read a book on punctuation that was entertaining. Until now. 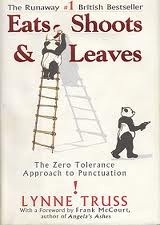 Eats Shoots and Leaves by Lynne Truss uses examples from everyday life to castigate those who refuse to punctuate properly. Whether it be the lack of understanding on how to appropriately use an apostrophe, or overcoming the fear of using the dreaded semicolon, Truss reviews the cases, and explains the scenarios for proper usage. This book is not an easy read, nor is it going to jibe with the American editorial rules, as it is written for a British audience. Still, I learned a lot from it; I’ve never been comfortable with that dastardly semicolon; I also discovered I’ve been mis-punctuating around my dialogue for years. I know that looks obvious now, and I was probably going to get a whole bunch of red marks in my manuscript from my editor regarding this third-grade error in the near future. But I’d never honestly thought about how it should be. I assumed I’ve been doing it correctly all my life. Good god, that’s just embarrassing now. Which is probably what Ms. Truss was going for. While it’s funny to read about signs in front of businesses claiming to be “Bobs’ Bakery”, it’s not so funny to find similar errors in your own, supposedly literate works. And now, I fear that as soon as I hit publish on this blog, Ms. Truss will descend upon it and begin marking it up with a digital Sharpie. But I’ll be okay with that once the blush fades from my cheeks, as I hope it will reduce future punctuation related tragedies. If you’re a writer, pick up this book. You’ll laugh a bit and learn a lot. I would think pretty much any book on punctuation would be entertaining! Actually, I have been known to read stuff like that. I haven’t read this particular book, but almost bought it once, if that counts for anything. It sounds great. By the way, misplaced apostrophes cause me a great deal of pain and indignation. Mar… if you do read this book, make sure you’ve seen Downton Abbey first, then read it as if listening to Maggie Smith. Completely awesome. I’ve seen one episode of Downton Abbey and definitely plan to watch more. From what I’ve seen, no apostrophe would dare misplace itself in the presence of Maggie Smith.